On August 2, 2013 I published a Torah Codes matrix in which the axis term was FLOOD ON MARS. On December 25, 2014 I put out another matrix about underground water on Mars (Mars MAVEN and Torah Codes Search for Ancient Martian Oceans). Scientists know that Mars once held huge amounts of water. But what happened to it? Actually, a lot of it's still there, not only just underground, but in the air, and yes, even flowing over the ground in many places too during times that are warm. On September 28, 2015 NASA held a press conference it which it was alleged that they had proof of running water at multiple sites on Mars. THE SEPTEMBER 28, 2015 PRESS CONFERENCE AT NASA IS HERE. While the source of the water is not yet pinned down, emphasis was placed on support for the idea of deliquescence. In reference to it NASA argues that perchlorate salts like those found on Mars have a special capability of being able to absorb moisture until they dissolve in the moisture absorbed and form a solution. Deliquescence occurs when the vapor pressure of the solution that is formed is less than the partial pressure of water vapor in the air. This is one possible explanation for formation of Recurring Slope Lineae (RSL) - the dark streaks shown growing on Animated GIF 1 below. They are assumed to be due to running water/brine. Soluble salts will deliquesce if Martian air is sufficiently humid. The NASA press conference does refer to snow seen falling at the Phoenix lander site, however it states that rain has never been seen falling on Mars. It also indicates that it's possible that the running water has an underground source, but proof of that will likely have to wait for results from a ground penetrating radar scheduled to be sent to Mars in 2020. As for no rain, as I indicate on my page about ultraviolet (UV) radiation on Mars, while UV at the Mars Science Laboratory (MSL) varied from low to very high, during the first 1,127 sols (Martian days) there was not a single date when opacity was not listed as "sunny." However, during those first 1,127 sols there were 86 with no data available (7.6% of the time), so perhaps we're missing something here. What caused at least 16 days with low UV, and why did whatever it was not result in a change to opacity that would read dusty or cloudy (or, since we now know that water flows on the surface of Mars, perhaps rainy)? Although I cannot rule out arguments that link water's ability to flow on Mars to widespread amounts of perchlorates dissolved in the Martian water, I submit that the running water is more likely to be linked to atmospheric pressure that is two orders of magnitude higher than what NASA has told us. The authors of the NASA study discussed here are operating under the assumption that the average pressure at areoid (the Martian equivalent of sea level) is 6.1 mbar (McEwen et al., 2014). As I'll explain below, I believe that it's closer to 511 mbar. Elsewhere on on my Marscorrect.com site I discuss fundamental design problems (tiny pressure sensor dust filters that clog with dust at the time of landing) in the Tavis pressure sensors sent to Mars on the Vikings and Pathfinder, and similar design flaws found on the Vaisala pressure sensors sent up on the Phoenix and MSL. Our report, MARS CORRECT: CRITIQUE OF ALL NASA MARS WEATHER DATA, shows that as a result of faulty pressure data, most of the Martian weather data available today is fatally flawed. ANIMATED GIF 1 BELOW: A time-lapse animation of Palikir Crater shows how the streaks extend and darken during warmer months on Mars, then gradually fade as temperatures cool. CAUTION: THE ACTUAL CLAIM IS A BIT LESS THAN WHAT IS READ IN THE HEADLINES. Lujendra Ojha and his colleagues created a computer program that could scrutinize individual pixels in pictures seen from Earth. This was necessary because the areas in concern are only about 5 meters (16 feet) wide. That data was then correlated with high-resolution images of the streaks. Scientists concentrated on the widest streaks and came up with a 100 percent match between their locations and detections of hydrated salts. "We're not claiming that we found ... evidence of liquid water. We found hydrated salts," Ojha said. Still, that was enough for NASA, which declared a "Mars mystery solved," in a press advisory. WHERE WAS MARS IN ITS ORBIT AND HOW LONG WAS DAYLIGHT EACH DAY ON THE THREE DATES SHOWN ON THE ANIMATED GIF ABOVE IN 2011? The position it held in orbit for these days is obtained from http://www-mars.lmd.jussieu.fr/mars/time/martian_time.html. TABLE 1 - SOLAR LONGITUDES, MONTHS, AND SOLS FOR RSL GIF 1. DAYLIGHT CALCULATIONS. As is shown on my son's calculation below (Table 2), the sun was above the horizon for 15.3 hours on March 3, 2011 (late spring at Palikir Crater). For April 27, 2011 (early summer) there were about 15.56 hours of sunlight. 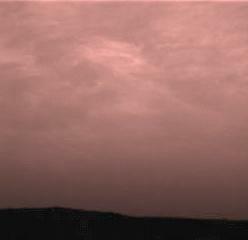 The last photo was for May 30, 2011 which was in the second month of Martian summer at the crater. Daylight hours then were down to 15.05 hours. A Martian day is 24 hours, 39 minutes. The last two rows of the calculation below are for RSL associated with Melas Chasma at 11.5° South. There daylight varied between 13.1 hours on the first day of summer to 11.6 hours on the first day of winter. However, McEwen et al., 2014 indicate on their Table 1 that at this position there is activity on the north facing slopes between Ls 133° and 161° and on the south facing slope between Ls 192° and 281°. Melas Chasma is south of the equator. The subsolar latitude is to the south only between Ls 208° in the first month of spring there to Ls 331° in the third month of summer. When water actually runs is affected by the slope. Figures 1B and 1C below are based on a slope of 40°. Water runs at Melas Chasma for a little over 41% of the Martian year. The water seen flowing at animated GIF 1 above for Palikir Crater, if all inclusive, represents only a little over 15% of the Martian year. Number of hours per sol when RSL were present at Melas Chasma varied from about 11.8 to 13.1 hours. TIMING OF THE ANNOUNCEMENT ON SEPTEMBER 28, 2015. The bulk of the announcement was not to show something that NASA has not known about before. Rather, at best it confirms what they at least suspected back in 2011. See SEASONAL FLOWS ON WARM MARTIAN SLOPES published in Science on 5 August 2011. This link will take you to more animated GIFs for Palikir Crater, Corozal Crater, Horowitz Crater and Raga Crater. The press conference on September 28, 2015 featured John Grunsfeld, an astronaut who now serves as Associate Administrator or NASA's Science Mission Directorate; Jim Green, NASA's Director of Planetary Science; Michael Meyer, Lead Scientist for NASA's Mars Exploration Program; by phone Alfred McEwen - the Principal Investigator for HIRISE, at the University of Arizona in Tucson and Luju Ojha, a PhD Candidate at the Georgia Institute of Technology. Of these five men, two - McEwen and Ojhu - led the list of authors for the 2011 paper about Recurring Slope Lineae (RSL) and running water on Mars. On the more negative side, there are many skeptics who want to know if it was a coincidence that such a spectacular announcement comes only four days before the release of the movie MARS starring Matt Damon. Indeed, the director of this $175,000,000 film, Ridley Scott, states that NASA timed its release to help the film. A word about Lujendra (Luju) from our Mars Correct Team: This guy is to be congratulated, even if NASA is milking his work for financial or political purposes. While NASA lists him as a Ph.D. candidate from the Georgia Institute of Technology, in checking our copy of the National Geographic book MARS UP CLOSE (Marc Kaufman, August 5, 2014), we see that on page 109 it states that, “The seasonal streaks (officially known as recurring slope lineae, or RSLs) were first identified by a University of Arizona student, Nepali undergraduate Lujendra Ojhu, who was studying a crater over time. His professor, HIRISE principal investigator Alfred McEwen, took his research, and together they published a paper in Science that broke the news." At the time of publication for MARS UP CLOSE in 2014, we read that "Since that discovery more than 25 sites with streaks have been photographed (and in winter without streaks), and some of the sites have more than 1,000 flows.” McEwen points out that, "We were actually taking images from these sites for four years before someone did the work to find that the slopes had these features in the warmer times and none when it was colder. As for the MARS UP CLOSE book, while it's a great reference book, my review on April 19, 2015 was less favorable because of numerous shortcomings with respect to how it dealt with (really, largely ignored) Martian meteorology. AT WHAT LATITUDES, WHEN AND WHAT TEMPERATURES HAVE WE OBSERVED EVIDENCE OF RUNNING WATER? Figure 1A below shows the known locations, but under 4% of the Martian surface has been imaged well enough to see the features. In accordance with the 2011 Abstract by Alfred S. McEwen, Lujendra Ojha, and Colin M. Dundas, Sarah S. Mattson, Shane Byrne, James J. Wray, Selby C. Cull, Scott L. Murchie, Nicolas Thomas, Virginia C. Gulick, RSL appear and lengthen in the late southern spring/summer from 48°S to 32°S latitudes favoring equator-facing slopes--times and places with peak surface temperatures from ~250-300 K. Later it was stated in a paper entitled RECURRING SLOPE LINEAE IN EQUATORIAL REGIONS OF MARS (McEwen et al., 2014) that there is "extensive activity of recurring slope lineae in equatorial regions of Mars, particularly in the deep canyons of Valles Marineris." The McEwen et al., 2014 paper shows the location of RSL at Acidalia Planitia in the northern hemisphere (see Figure 1A below) and states that there is one conformed site at 35° North latitude (which is the Acidalia Planitia site). Figure 1B shows the solar longitude (Ls) and temperatures where RSL form in afternoons on north, east, south and west facing walls of Melas Chasma in Valles Marineris on Mars. Figure 1C shows that while the range of ~250 to 300K was just given for temperatures, in fact where temperatures were below 273 K (the freezing point of water) they were not much below it. This may indicate that the concentration of perchlorates is not high enough to drive the freezing point down by 70 K, something that was shown on a slide by Luju Ojha at NASA at 22:15 into the NASA press conference on September 28, 2015 (see Figure 4B below). Rather, all three triangles that touched green, the color used to indicate a range of 250 to 273 K, also touched blue, the color used to indicate temperatures above freezing. FIGURES 1A TO 1C ABOVE (Adapted from McEwen et al, 2014). Figure 1A shows the location of Recurring Slope Lineae (RSL) where it is believed that liquid water (brine) flows on Mars. Note the location of Melas Chasma. Figure 1B shows what are projected surface and subsurface temperatures to a depth of 10 cm at Melas Chasma with directions given. Figure 1C shows the relationship between temperature, season and direction for RSL at Melas Chasma. FIGURE 2A above shows RSL at Palikir Crater on Mars. FIGURE 3 below: Location of RSL at Gari and Hale Craters on Mars. WHAT ARE PERCHLORATES? Perchlorates are salts of perchloric acid. An example is potassium perchlorate (formula KClO4). Figure 4A shows evidence in the form of spectra for magnesium perchlorate, sodium perchlorate and calcium perchlorate. Light is being absorbed at wavelengths of 1.9 and 2.1 microns. These wavelengths match what is seen with hydrated salts of perchlorate (ClO4). This means that there is water in the molecular structure of these salts. Ojhu claims that the Mars Reconnaissance Orbiter (MRO) observes the surface of Mars every day at roughly 3 pm which is the driest time of day. He says that most of the liquid water will have been completely evaporated then. However, he states that the molecular water trapped inside the salts will have been a bit more stable and that is exactly what they observed. This means that the source of molecular water or water in the crystal structure of salts is either due to RSL or some other processes that created these streaks. Regardless the presence of hydrated salts in the slopes means that the streaks are due to contemporary liquid water. Likewise at Palikir Crater they see presence of hydrated salts only when the streaks are present. WHAT WAS NEW AT NASA'S ANNOUNCEMENT AND WHAT CAN BE SAID ABOUT THE MOVIE? Whereas much of the NASA press conference of September 28, 2015 was a repeat of what was known and published by the same people up to four years ago, it seems like what's new, although delayed for release to help publicize the opening of the movie THE MARTIAN (see the trailer here) four days later, was that there's a 100% correlation between detection of hydrated salts of perchlorates with the presence of RSL. Our family plans to see the movie on October 13, 2015 and I'll likely comment on it more then, but the movie trailer is of interest because the film was made with some collaboration with NASA, and at 48 seconds into the trailer astronaut Mark Watney gets literally blown off his feet in a storm. If Martian air pressure is as low as NASA claims, that would never happen on Mars. Note: The landing coordinates for Watney's fictional landing in Acidalia Planitia are 31.2° North, 28.5° West. There are RSL in Acidalia Planitia, but so far the only such evidence published for running water is at 35° North (I don't yet have the longitude) which would be 224.2 km/140.125 miles further north. FIGURE 4A Below: Results from Spectroscopy when matching RSL with perchlorates. FIGURE 4B below: Effects of perchlorates on boiling and freezing points of water at pressures on Mars that are accepted by NASA. We dispute the accepted pressure 6.1 mbar at areoid and instead believe that the real pressure at areoid is about 511 mbar. We argue that the widespread presence of running water strengthens our case. As was stated earlier, evidence of running water is seen in places with peak surface temperatures from ~250-300 K. On Earth pure water freezes at 273.15K and boils at 373.15K. At the accepted low pressures on Mars (6.1 mbar at areiod, the Martian equivalent of sea level) Luju Ojha stated in the NASA press conference on September 28, 2015 that pure water is very unstable on Mars, being able to exist only between 0° C and 10° C (273.15K and 283.15K). He notes that it would boil above 10° C (50° F). He goes on to state that a perchlorate-brine form of salty water on Mars would stay liquid down to -70° C and not start boiling until the temperature reached 24° C (297.15K). The ~300K figure given above (which was from the 2011 article with Ojha's name on it) for areas with running water thus seems a little high, especially with issues related to latent heat of vaporization. Further, in examining our records for Mars Science Laboratory which is close to the Equator at 4.59° South there never was a temperature claimed (either before JPL revised its temperature data, or after) that was in the range of 300K or 297.15K. Nor was any such temperature recorded by any lander on Mars. Temperatures that high are only linked to what was allegedly seen from orbit. They are apparently also linked to ground temperatures on slopes that are inclined toward the sun. We maintain weather data based on what the MSL's Rover Environmental Monitoring Station (REMS) originally pubished and often revised (at times after they saw our corrections or reviews). We believe that what we offer is the world's clearest view of MSL data problems. Table 3 below will take you to our records and show you what they recorded as high and low air and ground temperatures seen so far at MSL Curiosity. TABLE 3 - LINKS TO OUR RECORDS OF MSL WEATHER DATA AND NASA REVISIONS OF THAT DATA. +21 on Sol 1 originally, change to N/A. After Sol 1, +18 on Sol 103 and other dates. YEAR 2 (sols 670 to 886). This chart goes up to the end of spring. -80 on Sols 675 and 676. YEAR 2 SUMMER Sols 865 to 1,020. Ls 270 to 360. * Note 1: For MSL Year 1 for minimum ground temperatures for the bulk of the first 443 days (with a hiatus in data until Sol 486) almost all original temperatures were revised down by 4 or 5 °C. The remaining temperatures remained essentially are the same. # Note 2: The ground temperatures are not very precise. Ground temperatures were supposed to be recorded with a thermopile on Boom 1 (which suffered some damage on landing). The ground temperature sensor requirement was to measure ground brightness temperature over the range from 150 to 300 K with a resolution of 2 K and an accuracy of 10 K. REMS has made a number of changes to ground temperatures they post since they began doing so in 2013. FIGURE 5 - Pressure calculations for Mars based on stratus clouds 12.318 km above areoid and a scale height of 10.8. WHAT IS THE REAL PRESSURE AT AREOID? The color photo mentioned above is shown on Figure 5. The evidence is based on stratus clouds seen 16 km above Mars Pathfinder. Pathfinder landed at 3.682 km below areoid, so 16 km above that would be an altitude of 12.318 km above areoid. Pathfinder is unlikely to have changed its own altitude very much over 16 sols. We first focus on what minimum pressure is required for stratus clouds to form in Earth’s atmosphere. The highest stratus clouds are cirrostratus. They occur at altitudes up to 13,000 meters. As is shown on Figure 5, at 13,000 meters the expected pressure on Earth is 163.33 mbar. With this pressure in mind we can make an estimate of pressure on Mars, but first we state the caveats. The pressures calculated do not factor in higher than terrestrial dust loads in the Martian atmosphere. Nor do they consider the gas composition of the Martian atmosphere (95% CO2 vs. about 0.04% on Earth). So at best we are shooting here for a ball park estimate. As is also shown on Figure 5, if we assume that (cirro) stratus clouds on Mars cannot form at a lower pressure than similar clouds on Earth, then using a scale height of 10.8 our spreadsheet indicates pressures of around 511 mbar at areoid, and pressures as high as 1,054 mbar at the bottom of the Hellas Basin (Note: Wikipedia lists the scale height for Mars as 11.1, however in accordance with a study by Hoekzema et al., 2006 we use 10.8). Using this same logic the indicated pressure for the MSL, 4.4 km below areoid, is about 767 mbar (767 hPa). There is an on-line boiling point/pressure calculator at http://www.trimen.pl/witek/calculators/wrzenie.html. Using it, at a pressure of 511 mbar the boiling point should be reduced from 100° C to 82° C. At MSL it should be about 93° C, and at the bottom of Hellas Basin it should be 101° C. However this doesn't mean that we should expect to see standing water, although we might find it. It's possible that as the water runs down the slope it might simply sink into porous rock at the bottom Note that the calculator is not perfect. If you enter values of 1,013.25 mbar for pressure (average pressure at sea level on Earth) and 100° C for a boiling point, then use the triple point pressure of 6.1mbar (which is supposed to be the average pressure on Mars at areoid), it gives you a -1° C boiling point. To get a 0° C boiling point the pressure checked has to be at least 6.13 mbar. The triple point of a substance is the temperature and pressure at which the three phases (gas, liquid, and solid) of that substance coexist in thermodynamic equilibrium. For water on Earth it is 273.16 K, 0.01 °C, or 32.018 °F. The highest pressure reported by MSL over its first 1,127 sols (Martian days) so far was 9.25 mbar. At that pressure the calculator has water boiling at only 6 °C. “Your nose smelled also a real issue. The fact that we at FMI did not know how our sensor was mounted in the spacecraft and how many filters there were shows that the exchange of information between NASA and the foreign subcontractors did not work optimally in this mission!” (Kahanpää, personal communication on 12/15/2009). And so when this particular man allows reports to be issued for at least five days that back our projected pressures; issues of personnel, agendas, and possible disinformation should not be overlooked. The REMS reports in question are shown earlier on Figure 17A in our Basic Report. While Kahanpää was clear about his dissatisfaction with NASA is his discussion about how his sensor was employed with Phoenix, I have not seen him write anything about the massive confusion that occurred again with his sensor on MSL. I can only state that the Phoenix and MSL sensors were essentially the same (as was shown on Figure 11A of our Basic Report) and both delivered to NASA in 2008 (http://space.fmi.fi/solar.htm). However, with Kahanpää as the man on the REMS Team directly responsible for pressure reports from MSL (at least until possible censorship), we see that all four incidents of highest pressures reported have been eliminated – the first five days in September 2012 (cut a hundred-fold), the 1149 Pa pressure for Sol 370 (reduced to 865 Pa), the 940 Pa pressure (changed to N/A for Sol 192 on February 19, 2013) and 937 Pa for Sol 200 (February 27, 2013) also changed to N/A. WHERE DID THE WATER COME FROM TO COMBINE WITH PERCHLORATES? On September 29, 2011 the European Space Agency published an article about how much water is on the Martian atmosphere. See "Evidence of Water Vapor in Excess of Saturation in the Atmosphere of Mars", by L. Maltagliati, F. Montmessin, A. Fedorova, O. Korablev, F. Forget, and J.-L. Bertaux, published in the 30 September 2011 issue of Science. Surprising new results, based on SPICAM data obtained during the northern spring and summer, indicate that the vertical distribution of water vapour in the Martian atmosphere is very different from previous assumptions. Writing in this week's issue of the journal Science, an international team led by Luca Maltagliati of the Laboratoire Atmosphères, Milieux, Observations Spatiales (LATMOS) in Guyancourt, France, describe SPICAM observations at infrared wavelengths that for the first time provide evidence for the existence of supersaturated water vapour on Mars. The atmosphere of Mars holds 10 000 times less water vapour than that of Earth. However, water vapour is a very dynamic trace gas, and one of the most seasonally variable atmospheric constituents on Mars. Under normal conditions on Earth, water vapour condenses around tiny dust or aerosol particles or salts when the atmospheric temperature drops below a certain "dew point". The atmosphere is then said to be "saturated", since it cannot hold any more moisture at that temperature and pressure. Any water vapour in excess of the "dew point" will normally condense to form droplets or icy crystals. However, supersaturation may occur when some of the water vapour remains in the atmosphere, instead of condensing or freezing. When condensation nuclei (assumed to be dust aerosols on Mars) are too rare, condensation is impeded, leaving substantial amounts of excess vapour. Extremely high levels of supersaturation were found on Mars, up to 10 times greater than those found on Earth. Clearly, there is much more water vapour in the upper Martian atmosphere than anyone ever imagined. It seems that previous models have greatly underestimated the quantities of water vapour at heights of 20–50 km, with as much as 10 to 100 times more water than expected at this altitude. Until now, it was generally assumed that such supersaturation cannot exist in the cold Martian atmosphere: any water vapour in excess of saturation was expected to be converted immediately into ice. However, the SPICAM data have revealed that supersaturation occurs frequently in the middle atmosphere – at altitudes of up to 50 km above the surface – during the aphelion season, the period when Mars is near its farthest point from the Sun. "The data suggest that much more water vapour is being carried high enough in the atmosphere to be affected by photodissociation," added Franck Montmessin, also from LATMOS, who is the Principal Investigator for SPICAM and a co-author of the paper. "Solar radiation can split the water molecules into oxygen and hydrogen atoms, which can then escape into space. This has implications for the rate at which water has been lost from the planet and for the long-term evolution of the Martian surface and atmosphere." The new paper analyses SPICAM data obtained when the Martian atmosphere is relatively dust-free. The absence of dust enables the instrument to measure the vertical profile to within 10 km of the planet's surface. The supersaturation levels are likely to plummet in the southern summer, when dust storms inject large amounts of aerosols into the atmosphere, increasing the supply of condensation nuclei. NOTE: As is shown on the figure below, at no point in the 1,127 sols since landing (as of October 12, 2015) have any relative humidity figures been included on reports by JPL's REMS Team. OTHER THAN RUNNING WATER ON MARS, WHAT OTHER SURPRISES HAVE WE SEEN THAT ARE INCONSISTENT WITH ACCEPTED LOW PRESSURE ON MARS? Mars Reconnaissance Orbiter (MRO) employed an aero-braking process. Its navigation team relied on an atmospheric model called the Mars-GRAM (Global Reference Atmospheric Model). Mars-GRAM is a computer database of information from what previous missions have encountered. It provided a prediction of the atmospheric density, giving the navigators an estimate of how far down into the atmosphere the spacecraft should go. The atmospheric density that MRO actually experienced was much different than what was predicted by the Mars GRAM (Atkinson, 2006).The most notable in the Atkinson article was, “At some points in the atmosphere, we saw a difference in the atmospheric density by a factor of 1.3, which means it was 30% higher than the model," said Han You, Navigation Team Chief for MRO. "That's quite a bit, but around the South Pole we saw an even larger scale factor of up to 4.5, so that means it was 350% off of the Mars GRAM model." Moving barchans sand dunes. "In discussing the movement of massive Barchan sand dunes, Nathan Bridges, (Planetary scientist, Johns Hopkins University's Applied Physics Laboratory) said, “Mars either has more gusts of wind than we knew about before, or the winds are capable of transporting more sand." Snow seen falling at Phoenix. This was not unexpected. Richardson et al. (2002) discussed snow on Mars before it was seen by Phoenix, but they declared that in order to get a good fit to all other data, cloud ice particle sizes must be used that are about an order of magnitude too large (that is, 20 µm rather than the 2 µm observed). They state that “significant work remains to be done assessing the quality of GCM predictions of Martian circulation vigor and resultant tracer transport.” They concede the need to bump up ice particle size to levels that are “unrealistically large.” While they were not specific about why the ice particles need to be so much bigger than those seen, it would make sense that if pressure were as low as advertised by NASA, the 2 µm ice particles would sublimate back into the atmosphere before the snow could fall, but that at 20 µm it could survive to hit the surface at such low pressures. If so, it follows that 2 µm ice particles survive because in fact the pressure is much higher than NASA has been telling us. Wherever we look at the weather plainly seen on Mars; our eyes, if open must refute pressures under 10 mbar. Frequency and location of dust devils. Our 6+ year study began with the question of how dust devils (shown on Mars below) could form if pressure is under 10 mbar (a near vacuum). The film clip below covers 12 minutes 17 seconds of what was seen by Mars Exploration Rover Spirit at Gusev Crater on Spirit Sol 543 (July 13, 2005). NASA AMES try to replicate them but had to kick the winds in their simulation up to 155 miles per hour, about three times the highest winds seen by Viking 1 and Viking 2. No other landers were able to accurately measure wind speed and direction. Dust devils are even seen in the caldera of Arsia Mons, a volcano that is 17 km above areoid (the equivalent of sea level on Mars) where pressure should be down to about 1 millibar, a thousandth of average Earth pressure. Stratus clouds 16 km above Mars Pathfinder. Spiral storms over Arsia Mons with eyewalls that are 10 km wide.